Thank you so much everyone for my Birthday greeting messages yesterday, you ALL made my day very special. I had a wonderful day, and enjoyed time spent with family and friends. I would like to say a big thank you to Sarah for posting my birthday again this year, and to ALL the cuties who sent messages, it made my day extra special. THANK YOU, to all the cuties who sent Birthday greetings yesterday. It was very thoughtful of you to take the time to post, very much appreciated. I had a wonderful day with family and friends. Sandra. Embroidery. Gifts for my new great niece, Penguin with the generous help of Dragonflyer, Kim. Other designs were freebies some time ago. Lace serviette rings, designs by Tavernmaker. A start on birthday presents for this year, I have made a dozen of each colour and style, they are super quick and easy, and stitch out beautifully. Thank you for looking. Sandra. Thank you so much everyone for taking the time to send my birthday wishes,I had a wonderful day with family and friends. Sandra. Cuties, is there any one living in the lower blue mountains, around Kurrajong, Grose Vale, or North Richmond areas in N.SW. Australia.. I would be so interested to know if anyone is close by these areas with similar interests to me. Sandra. Embroidery. Christmas angel for one of my sons tree. Thanks for looking. Sandra. More embroidery, quick and easy christmas gifts for family and friends, done on felt.Backed with colour co ordinated material and a magnet, assorted free designs. Thanks for looking. Sandra. Embroidered christmas gifts for family and friends. Assorted free designs, still drying on a towel is christmas trees from MyGarden Embbroidery free design,thank you Yoriko. Stitched out beautifully. Thanks for looking. Sandra. Cuties, i am needing some advice please if any one has a Janome 500e embroidery machine. As i am thinking of buying one next week, would appreciate any thoughts on their use of this machine. Any problems, and is it as easy to use as the information says. 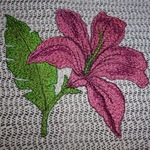 Embroidered on non slip shelf mat. Very pleased with the result. Thanks for looking. Embroidered more of Nathaniel's book. 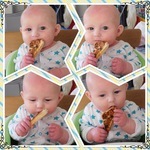 And a photo my DIL sent today Nathaniel who is now 7 months.